Airbnb has hit a plateau in the growth of their business because of a saturation of their target service in boutique lodgings. In order to continue to grow the business, they have to understand the analogous needs of their user base so they can provide offerings that fall within the existing brand promise. 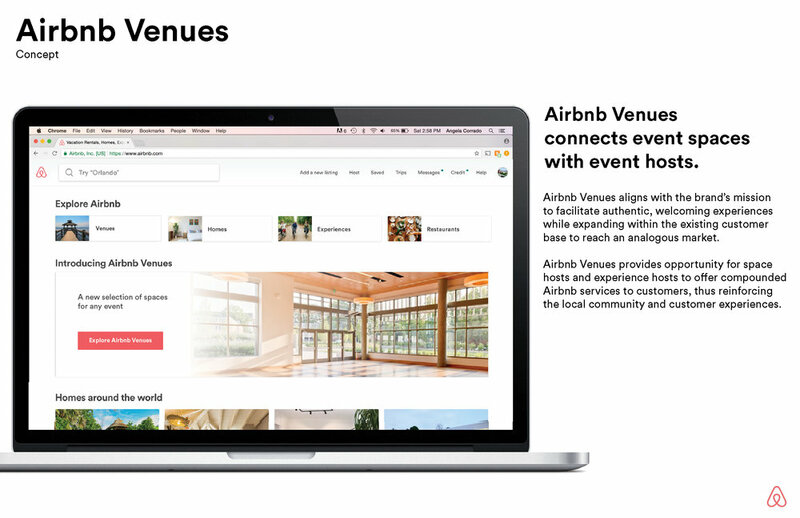 Airbnb Venues is a sub-brand of Airbnb that falls next to "Homes" and "Experiences" in their brand architecture. 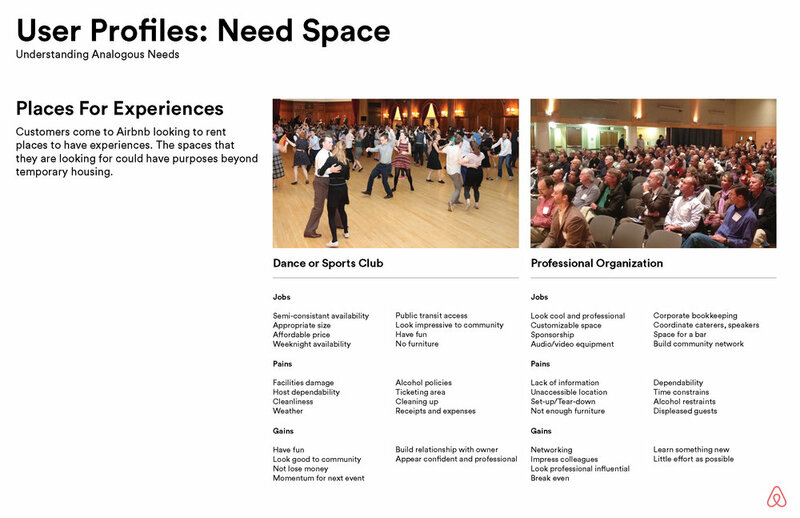 It is an opportunity for those who have large spaces to rent out to those seeking spaces for events. Airbnb has a strong brand and a dedicated user base. 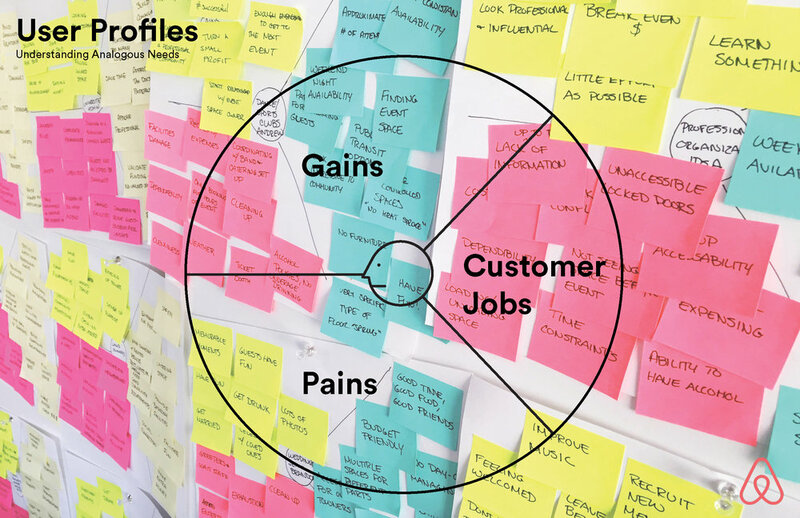 When approaching strategies for their growth we must leverage the momentum that they have already created while considering the challenges that can be solved for their users. Since 2008, Airbnb has saturated the boutique rental market. In an effort to grow their services, they have begun to offer experiences and expand their rental offerings to include small hotels. This is causing them to become more of a direct competitor with other online travel agencies. Airbnb represents a homely feeling of belonging anywhere, no matter where in the world their users find themselves. If they expand too far into commercial use cases they risk diluting their brand identity. 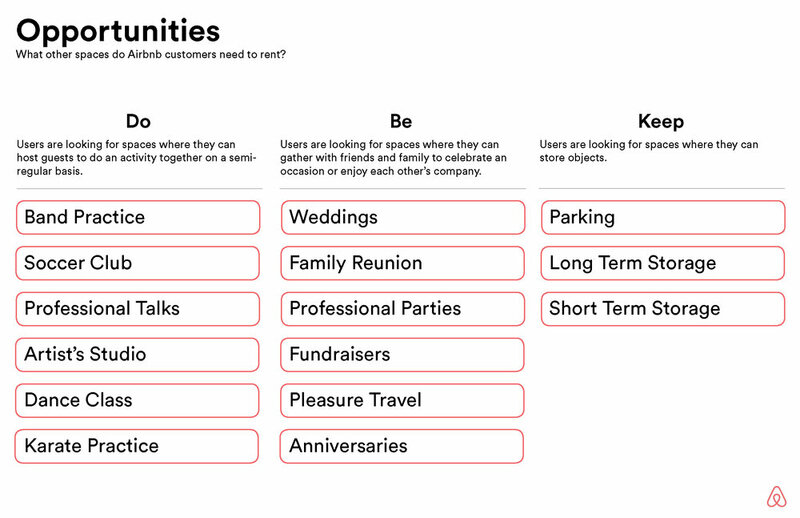 Airbnb can differentiate their services in a low investment way by pinpointing unmet analogous needs of their existing user base. There are opportunities for Airbnb to grow using their existing infrastructure. 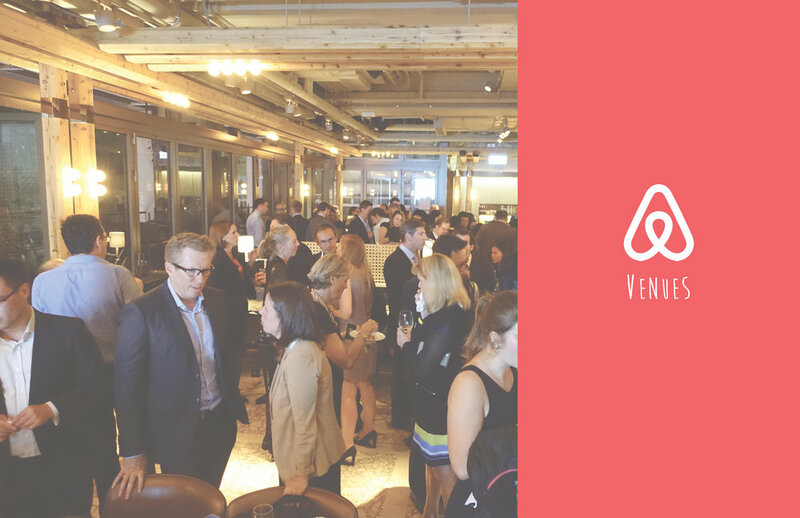 In order to find these opportunities, we must understand other needs that Airbnb’s users may have that fall within the umbrella of Airbnb’s brand positioning. 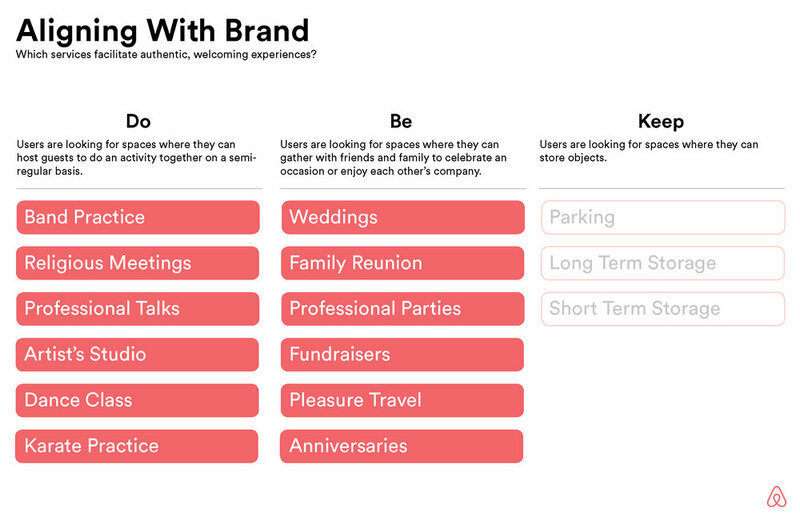 Airbnb is focused on providing their users with experiences beyond their interaction with the app. They take responsibility for their host's homes and cultures and promise their users that they will have a welcoming and pleasant experience. 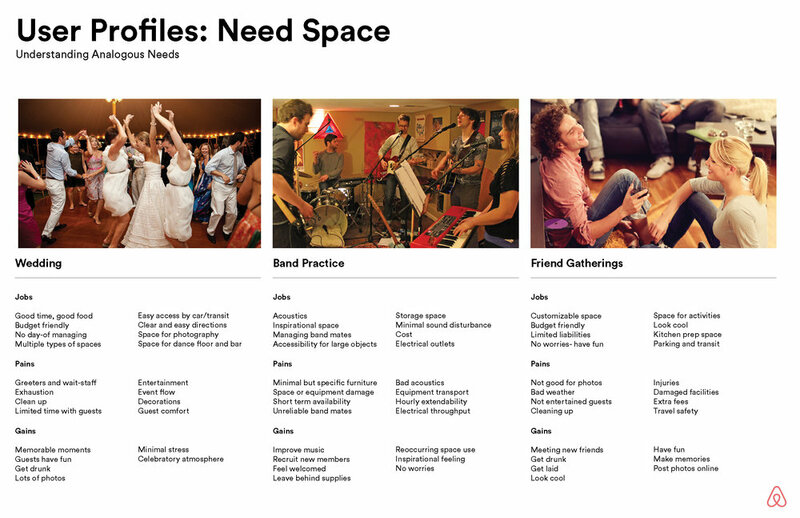 Airbnb Venues allows both of their users (hosts and guests) to have a local, cultural experience by facilitating gatherings for people to learn, connect, and enjoy. 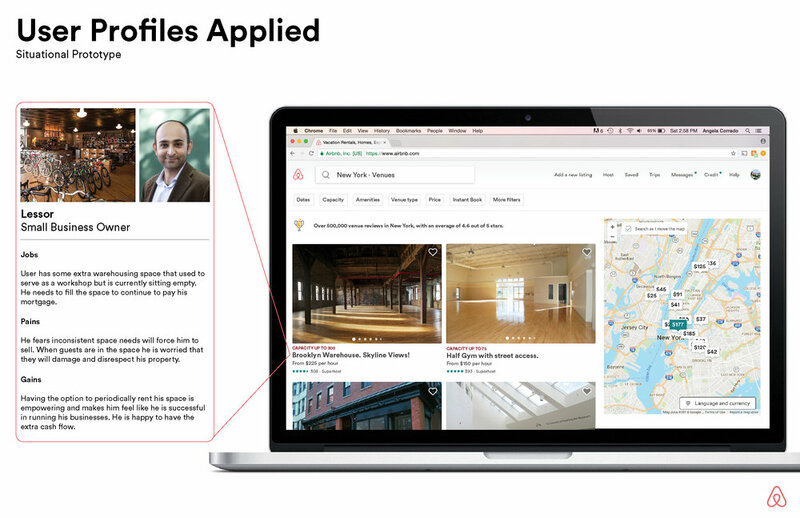 As an additional benefit, Airbnb Venues could connect with Airbnb Experiences to recommend appropriate services, entertainers, classes, and activities.